Monday Motivation: me and running | Fit Girl. Happy Girl. This is a little later than usual today, but better late than never! I’ve been so busy lately as I prepare for my next journey that it’s been really hard to keep up with the blog but I will promise you, there will be some really great things happening on here this week! One thing I haven’t lost track of is running, I’m all over that. 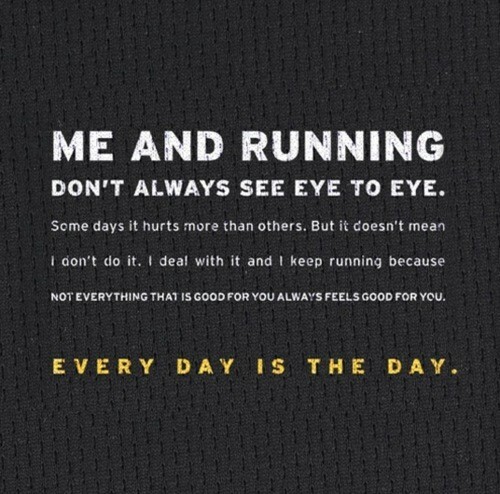 I really liked this graphic that I found on Pinterest because it’s always important to remember that even if a run isn’t great, or your body is telling you it’s time to rest, every run is a chance to grow stronger. Whether that means listening to your body and resting, or pushing your limits, every day is a chance to learn something new. Happy running this week! Just last night I learned in a phone conversation with Margaret about your new job. Congratulations! She said you’ll be relocating to the Lehigh Valley in Pennsylvania – and very soon. I’ve been to Allentown – just once years ago – and I think that’s in the vicinity, isn’t it? Clearly I must in future make more of an effort to check out your blog periodically, so I can keep up with your exciting new adventures. Cheers, girl! Thank you! Yup, I’m moving down to Pennsylvania in about two weeks and I’m very excited!